Home » Website Building » SEO » How to Use Google Disavow Links Tools? How to Use Google Disavow Links Tools? 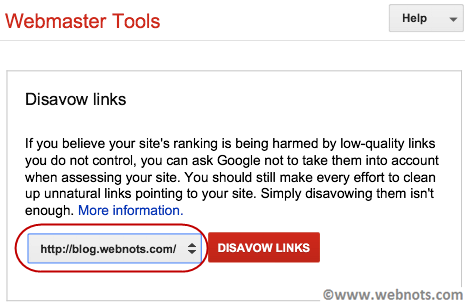 Disavow links is a final option for webmasters to inform Google to ignore the the spammy backlinks pointing to their sites. Use of this tool is generally part of the site cleanup activity required before raising a reconsideration request. Disavow links option is not available inside Webmaster Tools account, hence an external link is to be used to access this tool. Here is a step by step explanation of how to use this tool for effective results. The first step is to download all the inbound links pointing to your site. Login to your Webmaster Tools account and go to “Links to Your Site” option under “Search Traffic” tab. Click on the “More” link under the section “Who Links the Most”. 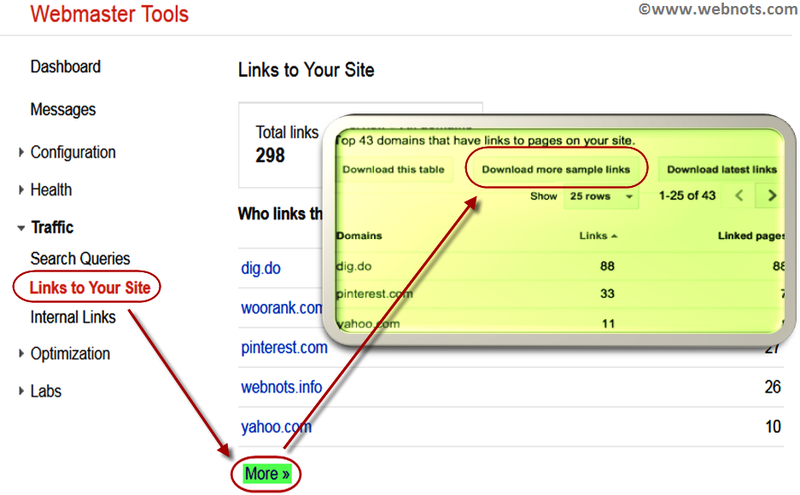 Click on the “Download More Sample Links” as shown in the picture. You have an option to inform Google to ignore the entire domain by adding a line “domain:DOMAIN-NAME.com” in the Disavow links text file. It is highly recommended that you enter link by link instead of using the complete domain. Ensure only one link is entered per line. You can insert comments in the text file using #. The final step is to upload the Disavow.txt file you created in the Step2. Click Here to go to the Disavow Links tool page (this option is not available inside the account). Select the site from the drop-down. Click on the “Disavow Links” button. Google will display a warning message regarding the potential danger of using the tool. It is important that you use this tool only when you are not able to remove the spammy backlinks in order to raise a reconsideration request and very sure that the links you mentioned in the file are causing a problem for your site ranking. It is not necessary to use this tool if no manual penalty is set on your site by Google. Once you are sure, Click on the Disavow Links button to continue. Click on the “Choose File” link and select the Disavow.txt file you created in the Step2. Click on the “Submit” button to submit your file to Google. The information you submitted will be accounted by Google during the recrawling process which may take a few weeks time normally. This means you need to wait till the time you notice the changes in your Webmaster Tools account “Links to Your Site” section before raising a reconsideration request. Ensure to download links from both WWW and Non-WWW versions of your site to get the complete list of backlinks pointing to your site since these two sites are considered as two different sites by Google. Don't add any additional links not available in the downloaded link file. Upload only text file. Avoid using Notepad file encoded in ANSI format. Ensure the text file is encoded in UTF-8 format. Don't upload document or excel file. Use only links entered per line in the file. Avoid adding information in the file without #. Add additional information using # in the start of each line. Avoid using complete domain in the file.